Pomegranates have been enjoyed for thousands of years and are a symbol of hope and abundance in many cultures. They’ve been found in Egyptian tombs, eaten by Babylonian soldiers prior to battle and incorporated into Persian wedding ceremonies to symbolize a joyous future. The pomegranate is native from Iran to the Himalayas in northern India and was cultivated and naturalized over the whole Mediterranean region since ancient times. It is widely cultivated throughout India and the drier parts of Southeast Asia, Malaya, the East Indies and tropical Africa. The tree was introduced into California by Spanish settlers in 1769. In this country it is grown for its fruits mainly in the drier parts of California and Arizona. 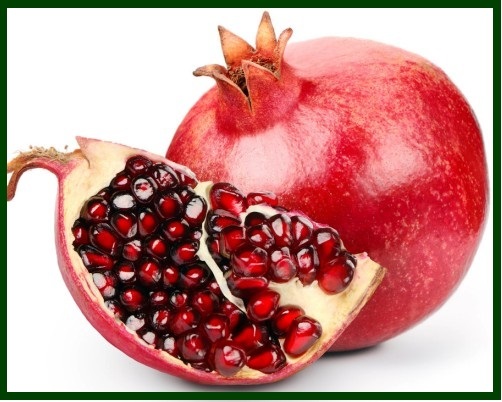 The name for the pomegranate fruit is derived from Latin and literally means “seeded apple.” Only the seeds are edible and are found inside this large, hexagonal-shaped red fruit. An average pomegranate contains about 600 juicy seeds, also known as arils, which are encapsulated in white pith that are juicy and sweet. The fruit has a very leathery texture on the outside that may be orange-yellow, red or purple. 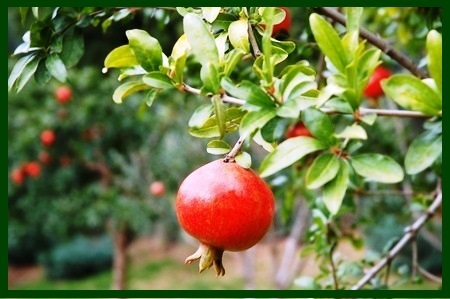 The pomegranate is a neat, rounded shrub or small tree that can grow to 12 to 16 ft. in height. It has glossy, leathery leaves that are narrow and lance-shaped. The attractive scarlet, white or variegated flowers are over an inch across and is self-pollinated as well as cross-pollinated by insects. The pomegranate fruit is low in calories, high in fiber, high in vitamins and high in phytochemicals that may promote heart health and help to prevent cancer. Arthritis Prevention – Studies have shown that both pomegranate seed oil and pomegranate fruit extract have anti-inflammatory effects that stop the destruction of joints caused by osteoarthritis. Boosts Digestive Condition – Pomegranate juice helps to secrete enzymes with anti-bacterial properties that aid digestion and help to fight off hemorrhoids, nausea, dysentery, intestinal parasites, piles and diarrhea. 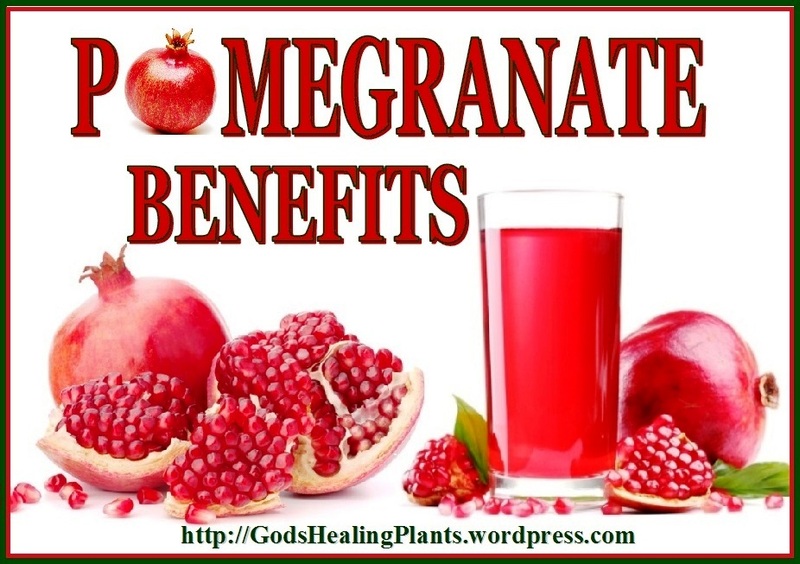 You can also use pomegranate juice as a laxative to treat constipation. 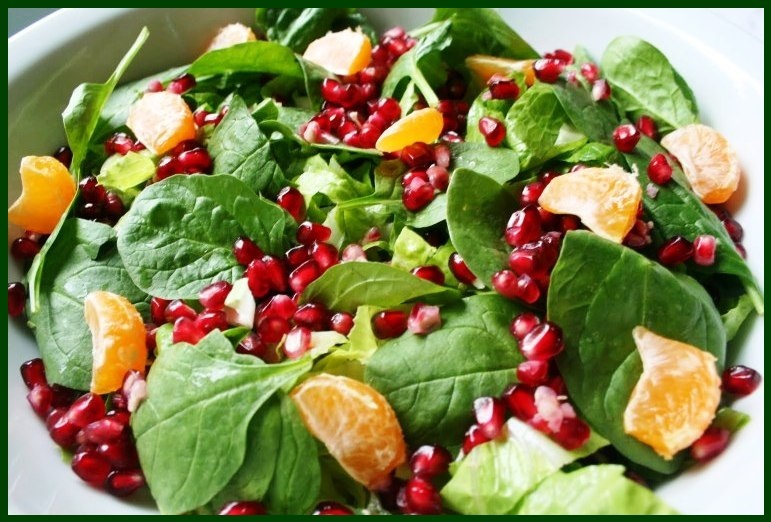 Cures Anemia – The high amounts of iron in pomegranates will raise hemoglobin levels in your blood to help correct anemia. Eliminates Free Radicals – The high levels of antioxidants like hydrolysable tannins or polyphenols in pomegranates help to minimize the effects of free radicals and remove free radicals from the body. Fiber Source – A single pomegranate contains nearly a quarter of the USDA’s daily recommended amount of dietary fiber, which helps you feel full and maintain a healthy weight. 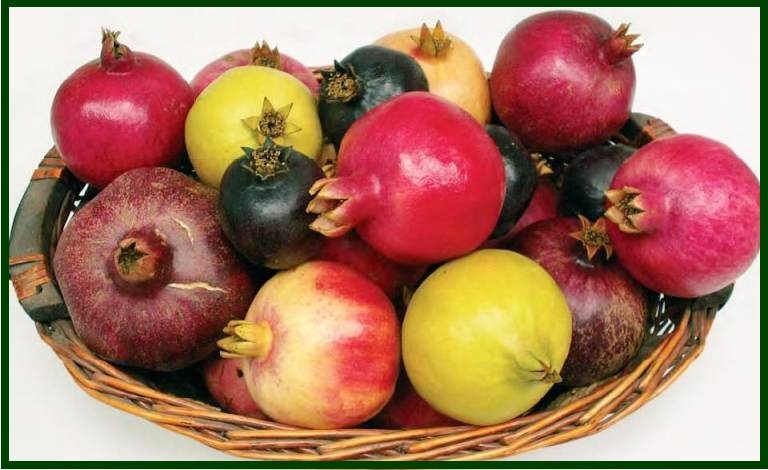 Fights Cancer – The antioxidants in pomegranates are effective in clearing away some types of cancer, including breast, prostate and skin cancers. 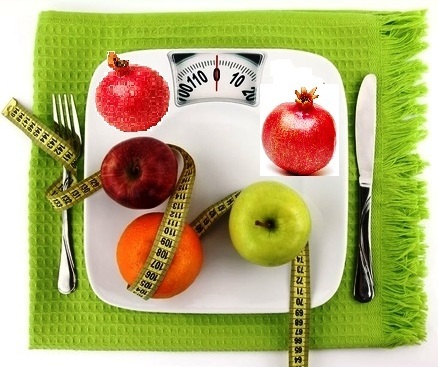 Helps Lose Weight – People are finding that pomegranates have a natural property that provides you with additional energy and cleanse the body, making it easier to lose weight. 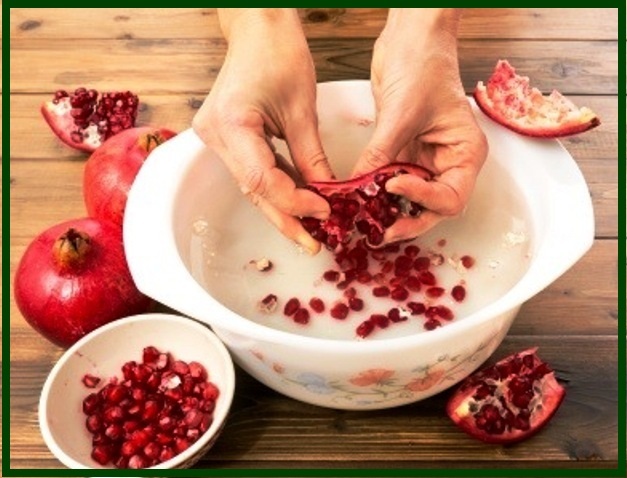 Helps with Dry Skin – Pomegranates are often added to skin care products because they have a molecular structure that can penetrate deep layers of most skin types to provide additional moisture. 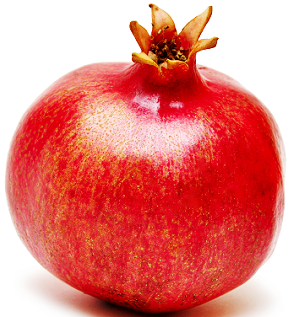 Improves Bone Quality – The enzyme inhibitors in pomegranate juice can help to prevent damage to the cartilage. It can also help to control cartilage degeneration to prevent osteoarthritis. Keeps your Teeth Clean – Rich in polyphenolic flavonoids compounds with antibacterial properties, pomegranate juice has been found to be just as effective as prescription mouthwash at ridding the mouth of plaque, the bacteria that causes cavities and gingivitis. 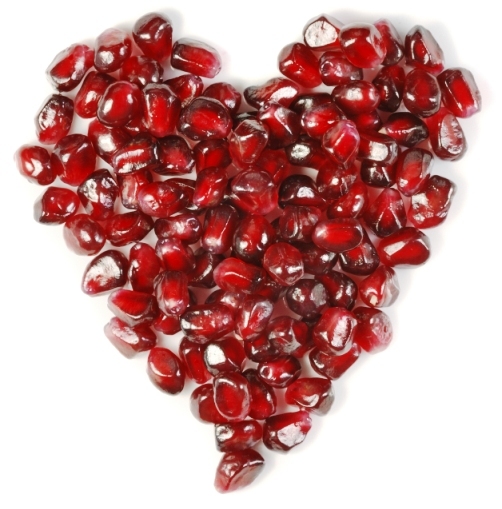 Promotes Blood Circulation – Pomegranates are often used to help relieve blood clots. Protects Cardiovascular Health – Pomegranate juice can act as a blood thinner and helps to remove plaque from the arteries that will help to minimize the risk of atherosclerosis. Consuming pomegranate juice can help lower LDL cholesterol and increase HDL cholesterol to improve heart health and reduce the risk of cardiovascular problems. Protects from the Sun – Consuming pomegranate provides the skin with compounds that help to protect against free radical damage which can cause sun damage, cancer and sunburn. The oil of a pomegranate contains the antioxidant ellagic acid that can help to inhibit skin tumors to protect the body from skin cancer. 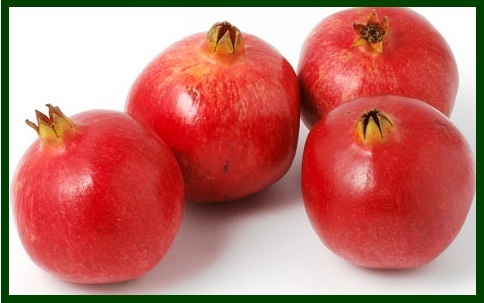 Reduces Inflammation – The anti-inflammatory properties of pomegranates stems from its high vitamin C content that will help to manage asthma, sore throat, cough and wheezing. Regenerates Cells – Pomegranate protects the epidermis and dermis by encouraging skin cell regeneration, aiding in the repair of tissues, healing wounds and encouraging circulation to skin that is healing. Regulates Cholesterol – Pomegranates contain paraoxonase—a naturally occurring enzyme in the body that helps keep LDL (bad cholesterol) from accumulating in arteries. 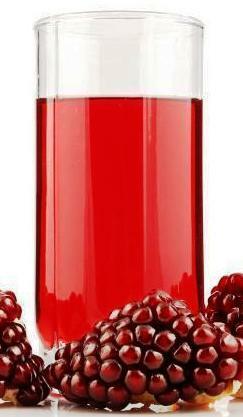 In one study, subjects who drank pomegranate juice for two weeks had an 18% increase in production of the enzyme. Skin Protection – Packed with potent antioxidants (including powerful ellagic acid), pomegranates help limit the damage of UV rays. They also defend against free radicals and increase collagen production. Slows Aging – Pomegranates can help to prevent hyperpigmentation, age spots, fine lines and wrinkles that are often caused by sun damage. Look for: pomegranates that are round, plump and heavy for their size. Avoid: pomegranates that have cuts and bruises. Store pomegranates up to a month in a cool, dry place or refrigerate up to two months. Refrigerate seeds in an airtight container up to 5 days. The fresh seeds deteriorate quickly once the fruit is opened. Seeds can also be frozen in an airtight bag for up to three months. Cutting a pomegranate can get messy and stain clothes, so wear an apron or an old shirt. First, fill a large bowl with water. Slice off the top, and then cut a slit through the skin of the pomegranate. Split the fruit open with slit facing away from you. Break the fruit into chunks under water and remove arils (seeds). The seeds sink, and the white membrane floats. Once you get past the multitude of seeds, its juice is tangy, sweet, rich and flavorful. This juice becomes the base for sauces and flavorings for drinks, savory dishes, and sweets, while the whole seeds are a simple delight eaten fresh or used as a colorful garnishing accent when sprinkled on salads and dishes.